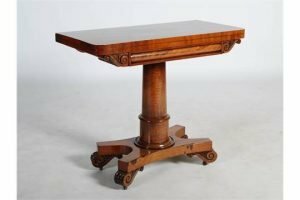 A 19th century mahogany games table, the hinged rectangular top opening to a red baize lined interior, above a convex frieze with scroll carved ends, raised on a tapered cylindrical column and concave platform base with four scroll carved feet resting on casters. 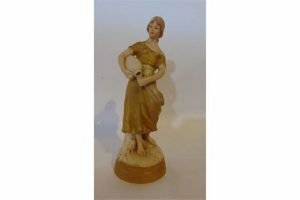 An early 20th century Royal Dux figure of a female water carrier, with raised pink triangle mark to base. 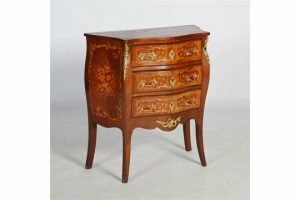 A George III mahogany night cupboard, the pierced gallery top above a pair of panelled doors and a pull-out commode drawer, raised on block legs. 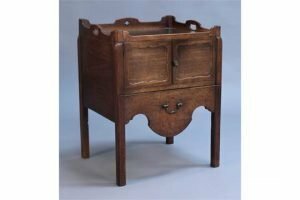 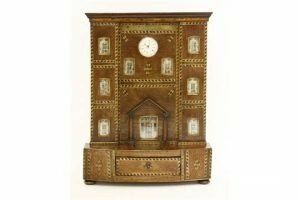 A 19th century mahogany watch stand of architectural form, with strung and inlaid decoration, on a bowed base with a single drawer. 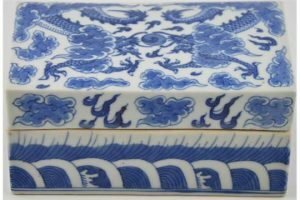 A Chinese 19th century blue and white porcelain box and cover, decorated with twin dragons chasing a flaming pearl amongst clouds, bears a four character Daoguang seal mark to the base. 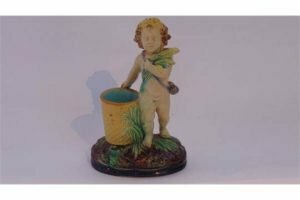 A 19th century majolica spill vase, in the form of a cherub and standing beside a basket and raised on an oval base, with indistinct impressed mark to underside. 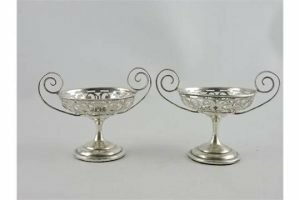 A pair of silver Art Nouveau two handled bonbon dishes with pierced bodies, Birmingham 1908. 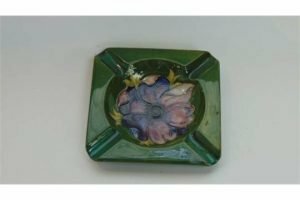 A Moorcroft green ground ashtray of square shaped form, with cigarette rests to each corner, with painted decoration to the centre of a pink and purple anemone and with impressed mark to base. 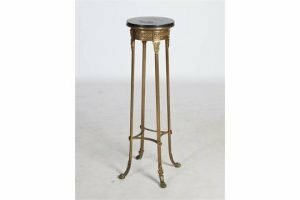 An early 20th century gilt metal and marble topped jardiniere stand, the black marble top above a mask and foliate frieze, raised on four supports with foliate cast paw feet united by concave stretchers. 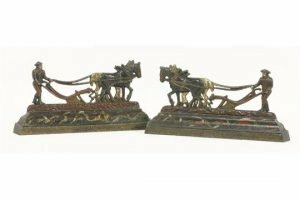 An unusual pair of Scottish Victorian painted iron chimney ornaments, each in the form of a ploughman and team, each base cast with lines from Robbie Burns. 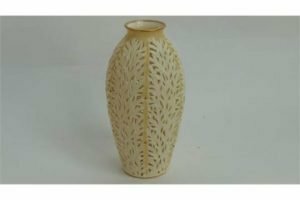 A late 19th century Graingers Worcester vase, with ivory glaze and reticulated finish in the form of overlapping leaves, with brown printed mark to base. 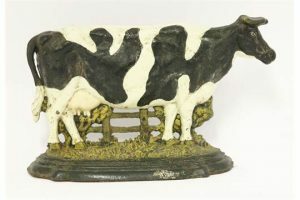 A large Victorian iron doorstop in the form of a Friesian cow, naturalistically painted. 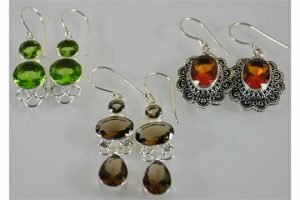 Three assorted pairs of silver earrings with peridot, citrine and amethyst stones. 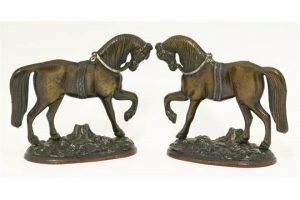 A pair of Victorian cast iron horse chimney ornaments, with a bronzed finish and coloured detail. 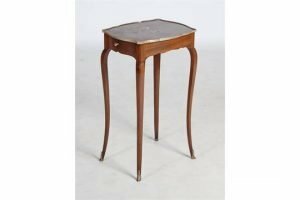 An early 20th century French mahogany, lacquer, mother-of-pearl inlaid and silver metal mounted occasional table, the shaped rectangular top decorated with a foliate spray and butterfly, above a single drawer, raised on slender cabriole supports with silvered metal sabots. 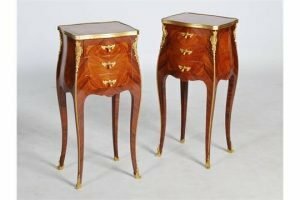 A late 19th/ early 20th century French Louis XV style kingwood, marquetry and gilt metal mounted serpentine commode, the shaped top inlaid with flowers above three drawers, raised on splayed tapered square supports. 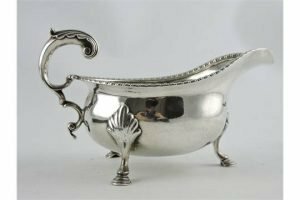 A large late Victorian silver sauce boat, of oval form, with gadrooned border and leaf capped flying scroll handle on three stepped hoof legs, London 1897. 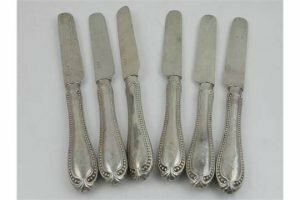 A set of six Russian white metal bread knifes, hallmarked to blade.